A 17-year-old student was arrested Monday for allegedly posting a threatening video on social media toward his high school in Pembroke Pines. The male student from West Broward High School allegedly posted a video on Snapchat of him racking a semi-automatic handgun at Nexus Gun Range in Davie. A 17-year-old student was arrested Monday for allegedly posting a threatening video on social media toward his high school in Pembroke Pines. 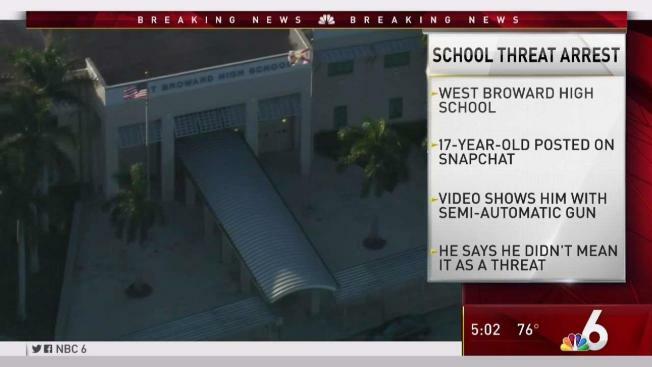 The male student from West Broward High School allegedly posted a video on Snapchat of him racking a semi-automatic handgun at Nexus Gun Range in Davie with the text, "Me if U don’t vote for me for Senioritis," Pembroke Pines police said in a news release. The suspect told police he did not intend to act on the threat and that he does not have access to firearms at his residence. The student, whose identity has not been released, was charged with second-degree felony for making a false report concerning the use of a firearm in a violent manner, according to police. The Marjory Stoneman Douglas High School Public Safety Act was enacted in early 2018 and states anyone threatening to engage in a mass shooting or terrorist act will be charged with second-degree felony.